WHAT'S INSIDE 3 Singles Meet 9 GeoCachers 10 The Salvation Army 10 Restaurants 11 Rock & Gem Club 12 Editorial 13 Letters to Editor 16 Around Town 21 Band Aid 24 Hi Jolly Daze 26 Library Program 27 QES Board Members 29 Music in the Desert 30 Desert Flyers 31 Bernie & Red 35 Bingo 32 Music Jams 30 Senior Moments 31 Snakeproof your dog 32 Herb Mama 37 In Memoriam 38 Churches 41 Museum Updates 43 Sam Rotman Concert 40 Nancy's Kitchen 40 Show Schedule 44 Parade PHOTOS 45 Classifeds 45 Paul Winer's Cartoon www.DesertMessenger.com • "Quartzsite's FREE Community Paper" • 928-916-4235 WEDNESDAY, January 18, 2019 VOL. 15 # 292 Now in our 15 t h YEAR! Always FREE! 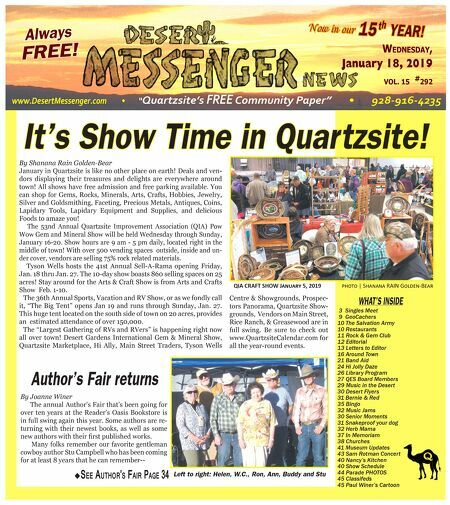 January SEE AUTHOR'S FAIR PAGE 34 QIA CRAFT SHOW J������ 5, 2019 ����� | S������ RAIN G�����-B��� Author's Fair returns By Shanana Rain Golden-Bear January in Quartzsite is like no other place on earth! Deals and ven- dors displaying their treasures and delights are everywhere around town! All shows have free admission and free parking available. You can shop for Gems, Rocks, Minerals, Arts, Crafts, Hobbies, Jewelry, Silver and Goldsmithing, Faceting, Precious Metals, Antiques, Coins, Lapidary Tools, Lapidary Equipment and Supplies, and delicious Foods to amaze you! The 53nd Annual Quartzsite Improvement Association (QIA) Pow Wow Gem and Mineral Show will be held Wednesday through Sunday, January 16-20. Show hours are 9 am - 5 pm daily, located right in the middle of town! With over 500 vending spaces outside, inside and un- der cover, vendors are selling 75% rock related materials. Tyson Wells hosts the 41st Annual Sell-A-Rama opening Friday, Jan. 18 thru Jan. 27. The 10-day show boasts 860 selling spaces on 25 acres! Stay around for the Arts & Craft Show is from Arts and Crafts Show Feb. 1-10. The 36th Annual Sports, Vacation and RV Show, or as we fondly call it, "The Big Tent" opens Jan 19 and runs through Sunday, Jan. 27. This huge tent located on the south side of town on 20 acres, provides an estimated attendance of over 150,000. The "Largest Gathering of RVs and RVers" is happening right now all over town! Desert Gardens International Gem & Mineral Show, Quartzsite Marketplace, Hi Ally, Main Street Traders, Tyson Wells It's Show Time in Quartzsite! By Joanne Winer The annual Author's Fair that's been going for over ten years at the Reader's Oasis Bookstore is in full swing again this year. Some authors are re- turning with their newest books, as well as some new authors with their fi rst published works. Many folks remember our favorite gentleman cowboy author Stu Campbell who has been coming for at least 8 years that he can remember-- Left to right: Helen, W.C., Ron, Ann, Buddy and Stu Centre & Showgrounds, Prospec- tors Panorama, Quartzsite Show- grounds, Vendors on Main Street, Rice Ranch, & Greasewood are in full swing. Be sure to check out www.QuartzsiteCalendar.com for all the year-round events.